A new portable device for deaf-blind people allows them to have face-to-face conversations, make phone calls using a text relay service and communicate by SMS. The DeafBlind Communicator (DBC) consists of a Braille note-taker linked by Bluetooth to a mobile phone. 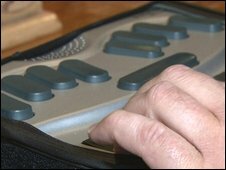 The DBC is made by assistive technology firm HumanWare and was developed in partnership with the Washington State Office of Deaf and Hard of Hearing (ODHH) as well as several deaf-blind individuals. Using the device, a deaf-blind person can have real time conversations in pubs and shops, with sighted friends or when conducting confidential meetings – for example with a doctor or solicitor. With the Braille note-taker – a device also made by HumanWare called the BrailleNote – the deaf-blind person types a message into the device which comes with either a standard Braille or QWERTY keyboard. This is then delivered to the screen of the mobile handset – which has special software installed on it – and the person responding then types a message back using the handset’s QWERTY keyboard. When the mobile phone is first handed to a new speaker, it uses a voice message to inform them that the person using the equipment is blind and unable to hear. It then asks them to communicate by typing a message on the mobile’s keyboard. Once the sighted person has pressed the return key, a message is sent to the BrailleNote, the deaf-blind person replies and so the exchange can continue. 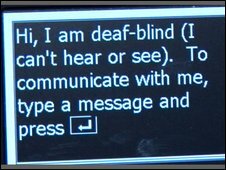 The deaf-blind version of the BrailleNote has a landline connector built in which enables the user to dial up a text relay service – for example the BT-funded Typetalk service – to enable deaf-blind people to use the device to make and receive phone calls. The DBC also gives deaf-blind people access to SMS text messaging – which has become one of the most commonly used forms of communication. The deaf-blind person simply needs to purchase a SIM card from a mobile network operator in order to activate the service. The device also contains some more advanced applications which are ordinarily hidden from new users in order to reduce complication. These include a word processor, a planner, an e-mail client, an internet browser and a digital book reader. As and when the deaf-blind person feels ready to use them, they can be activated easily and quickly. The DBC can also use instant messaging services like Google Talk. “Imagine the freedom that comes from being able to communicate with nearly anyone, anywhere,” said HumanWare’s Jim Halliday. To see the DBC in action, the BBC met Graham Hicks at a city centre pub in Peterborough. Mr Hicks is deaf-blind and has written an evaluation report on the device for HumanWare. He was able to go to the bar and order drinks from a member of staff who had never seen the DBC before as well as answering some questions from us. The conversation took much longer than it would have between fully hearing and seeing people. However it proved to be an effective system by providing a link between two people that would otherwise be impossible. “This gives us a great advantage that we have waited many years for”, said Mr Hicks. Mr Hicks described the device as liberating, by giving a deaf-blind person the ability to act independently. The DBC costs between £4,400 and £5,400 depending on the size of Braille display required. Money to purchase the device could be obtained from the government’s Access to Work fund if the deafblind person is in work, and those in education could also get help with the cost. You are currently browsing the archives for the Braille category.